Minister of State Edmond ‘Clear the Land’ Castro seems to be in the middle of one scandal or the other. Just a couple years ago, Castro was fired by Prime Minister Barrow for his involvement in a land hustle. He did political penance and was welcomed back into the fold – and then was named in a diplomatic incident accused of making unwelcome advances to a Taiwanese chaperone while on an official visit to that country. Shortly after, he was accused of large scale and very lucrative visa facilitation by an individual who allegedly paid him two thousand dollars per visa. And in late 2013, documents surfaced showing that Castro was recommending visas for Chinese nationals on a weekly basis. 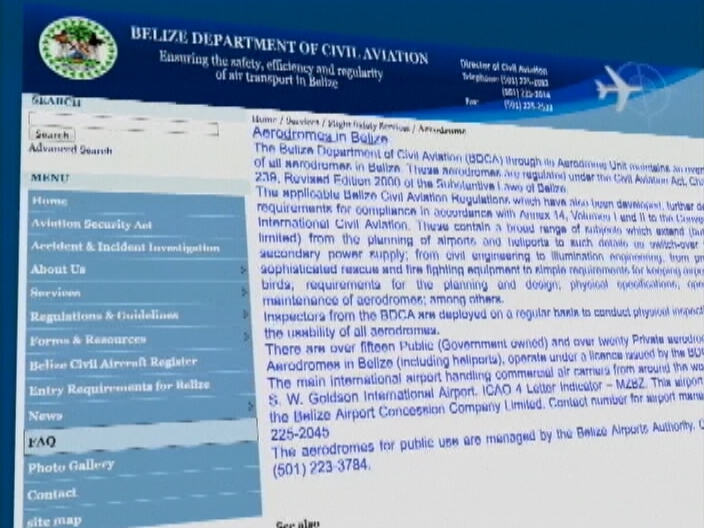 Now Castro is under fire again, this time for checks paid out by the Belize Airports Authority. Mike Rudon has the story. 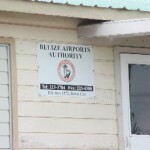 The Belize Airports Authority operates under the Department of Civil Aviation, which is listed under the Ministry of Transport, run by Minister of State with responsibility for transport, Edmond Castro. When we checked the official website, the BAA is said to be responsible for managing aerodromes, or small airports, for public use. So why is the BAA writing checks to Edmond Castro? And why is the BAA writinig checks which a reliable source says are to pay debts incurred by Castro? 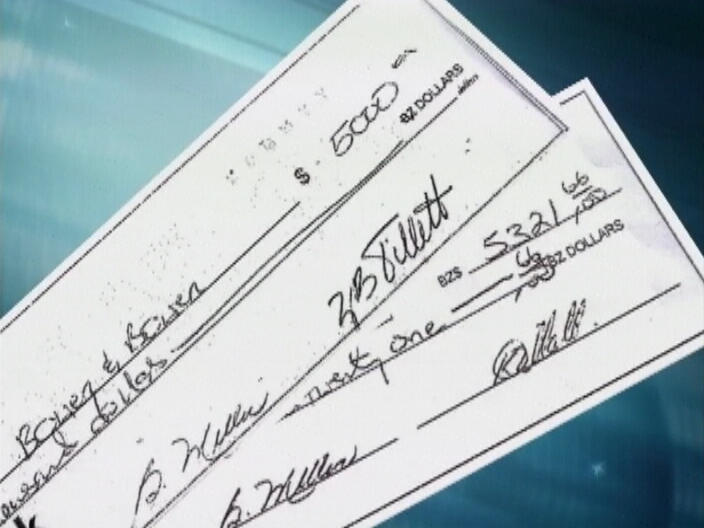 Nine checks have surfaced so far. Two are to Bowen and Bowen. The first is for five thousand dollars and the second is for five thousand, three hundred and twenty-one dollars and sixty six cents. 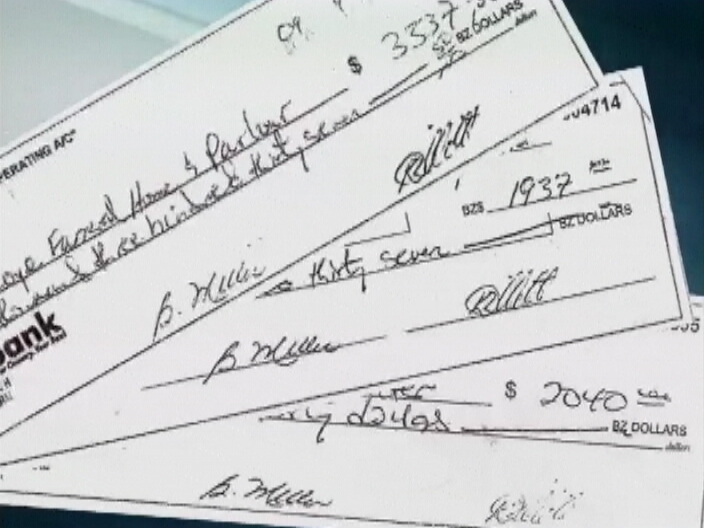 According to the source, both checks were used to pay for beverages at political functions hosted by Castro. Then there are three checks made out to Edmond Castro – one for four thousand dollars, one for nine hundred dollars and the last for five thousand, one hundred and fifty-six dollars and fifty-five cents. The last of those, it is alleged, was given to Castro to defray expenses for the burial of a family member. And then there is a check made out to David Coye Funeral Parlour in the sum of three thousand, three hundred and thirty-seven dollars and fifty cents, which we are told is related to that very same burial expense. And one made out to Ordonez Bike Shop for one thousand, nine hundred and thirty-seven dollars. Edmond Castro manages a cycling team, and our source claims that was to pay for repairs to bicycles, which he picked up himself from the bike shop. And then there is a check to the Dental Center for two thousand and forty-dollars. It is alleged this one is to pay for dental work for one of Castro’s special friends. And finally there is a check for three thousand, two hundred and twelve dollars and seventy-nine cents which, we are told, paid for turkeys given away at Christmas. We actually talked to General Manager of the Belize Airports Authority Kenworth Tillett. He told us that he is not going to say anything about any checks, and we can write what we want. We also spoke to Minister of State Edmond Castro, who told us that he didn’t write the checks, so he can’t tell us anything about them, even the ones written directly to him. He claimed that if we wanted answers, we would have to go to the BAA. The checks listed, and we are told there are many more, amount to the fleecing of the bank account of the authority. And while Castro refuses to comment, there are plenty who are willing to do so. Mike Rudon for News Five. There was a house meeting in Belmopan today, and it was full of news. The first big piece of news was that after missing three meetings, Elvin Penner showed up at the House Meeting, and sheepishly slunk to his position at the extreme far end of the UDP back bench, about 10 feet across from any other representative. That ends his streak of three missed meetings – six missed in succession would have disqualified him from the House. Later we’ll talk to the Prime Minister about why he continues to receive public pay. Other news today from the house was that the police seemed to be preparing for a crowd, after the NTUCB applied for a permit to protest. They put up the rope barrier but it wasn’t necessary because while the NTUCB did show up, it was only 11 of them, and they were there to hear the introduction of the Occupational Safety and Health Bill. Later on, you’ll hear why the Speaker didn’t want to let them into the House. All that’s coming, but first to the news of the day. On December 20th., the Belize Times broke the story of checks paid out by the Belize Airports Authority to Minister of State in the Minister of Transport, Edmund Castro. Since then we’ve been following the story and the paper has published 9 cheques, three of them made out directly to Castro totaling 10 thousand dollars, others to bike shops, chicken shops, beverage companies, funeral homes for another 15 thousand – allegedly in furtherance of his political work as Belize Rural North Representative. A hot story, but it’s been kind of bubbling under the surface because Castro hasn’t commented and the Airports Authority has clammed up. 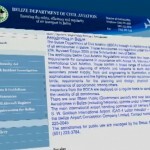 "I have in position here today, copies of some 60 Belize Airport Authority operating account Belize Bank Checks, which in my view demonstrate a consistent pattern of ongoing misuse and abuse of the authority's funds for personal and political purposes by the Member for Belize Rural North. There are at least 10 cheques in varying amounts, Mr. Speaker, which are made out to members of the Member for Belize Rural North's family. Cheque # 005067 for $400, cheque #004750 for $520, Cheque # 005144 for $1,132, Cheques made out to Ionie Castro. Apparently, the member was not satisfied that they were paying for thing on his behalf; There are cheques here made out to him. Cheque number zero-zero-four-nine-five-four in the amount of nine hundred dollars to Edmund Castro-Belize Bank cheque Airport Authority to Edmund Castro. Cheque number zero-zero-four-nine-five-seven in the amount of four thousand dollars to Edmund Castro, Belize Airport Authority cheque number zero-zero-five-zero-six-six in the amount of five thousand one hundred and fifty-six dollars and fifty-five cents made out to Edmund Castro. Man this is absolute nonsense Mister Speaker, absolute nonsense, and that is just a sampling man. 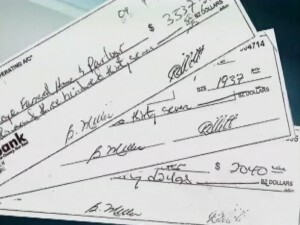 I have over sixty cheques here either made for the member’s personal-use for him to cash or for him to use for political purposes or to help family members. Look, you know, how far we've come. The Hon. Prime Minister saying that he would for a whiff of corruption, now finds himself at every turn defending and embracing corruption, man. Let us put these things on the table. Let us put these things on the table, and let us get proper answers from those responsible. Stop defending it. There is a growing perception out there that corruption is eating away at this U.D.P. government and the Belizean people have had enough. And so it is a very important issue Mister Speaker and as I said earlier, our prime minister who started out on this very high horse and very high note of not being prepared to even stand a whiff of corruption now finds himself in the unenviable position of having to be defending everybody who is involved or alleged to be involved in corruption and it is eating away across the government." "This is not corruption. The Airports Authority in the full exercise of their jurisdiction obviously assisted the minister on several different occasions. I will tell you right off that I find it utterly and completely distasteful and I think the Airports Authority and the minister are both wrong. So don’t think I am here making any apology for anybody, but call it what it is man. It is not corruption. He didn’t steal the money from the Airports Authority; he didn’t get the money under false pretences. He obviously was of the view that the Airports Authority, which is a statutory body associated with the section of the ministry for which he is responsible, could be asked to assist him and his constituents politically. I have spoken to the Members of the Authority, and I have told them upon pain of being fired, not another cheque or form of assistance must be given to the Minister. How will they pay it back? It was legitimate in terms of the authority the jurisdiction of the airport authority to make contributions. That's my point; there was nothing illegal about it. There is nothing corrupt about it, but it is in terms of appearances very very wrong. And indeed, nobody in the public wants to know that minister goes to a statutory body under his jurisdiction, and gets money for a,b,c,d,e,f, including for purposes of assistance for himself and for members of his family. Don't ask me, in other words, to fire the minister for being the recipient of funds that were given with every authority to him by the BAA. The BAA should never have done it. And if he asked them, in my view, he should never have asked them, and I think it's a serious error of judgment." "Sir, but these are public funds, he should not be able to use public funds at his whim, or to access them." "I don't know if it was at his whim, for whatever purposes he used the funds for. 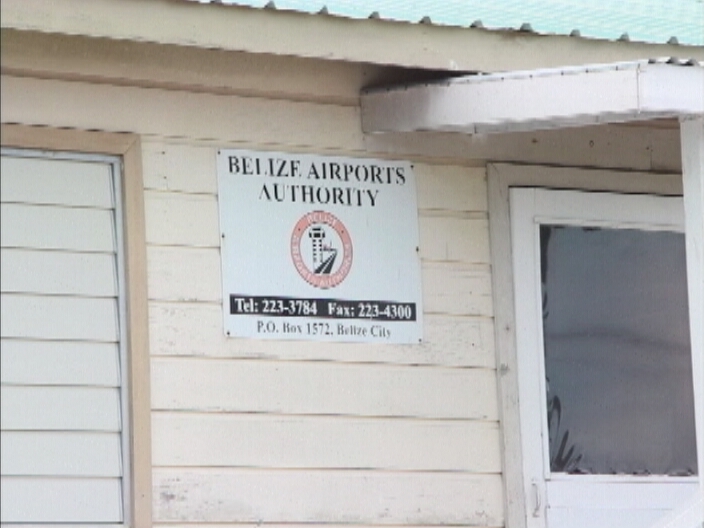 The Board, the Belize Airports Authority approved the issuing of the cheques, the disbursement of the funds to him. I can't say too many times that I consider that extremely ill-advised and wrong, but every board has the authority to make payment that the purposes that the board approves. I - had I been on that board - would have absolutely resigned in protest, if other board members in the majority had insisted on doing what was done. But the board, as a board approved, that's - I'm afraid - it, in so far as sanctions or legal repercussions are concerned. Political consequences, of course, are multiple, and I am afraid I have to - and the Government - are taking a lick for it and deservedly so." "And I spoke to the CEO yesterday, and he said that whatever cheques that are above $5,000, if he signed any of those, he would have signed pursuant to board authorization. 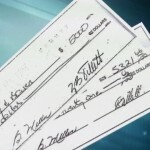 He did concede that he signed cheques for smaller amounts in the exercise of his discretion, but again, there is nothing on the face of it legally wrong. There is everything on the face of it politically wrong, and I accept that." Castro did not attend today’s House Meeting.